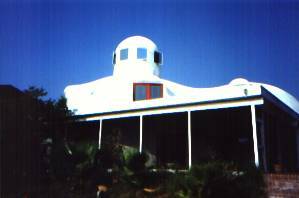 A stunning Monolithic Dome home overlooking pristine St. Joe Bay with access to the beaches of Cape San Blas across the street. This home offers stunning views of St. Joe Bay with beautiful white sandy beaches 1500 ft. away. Cape San Blas, a dedicated nature preserve with restricted development is an hour from Panama City, Fl. The Cape forms the famously pristine St. Joe Bay and is home to the World's #1 Beach on the Gulf of Mexico side. The Cape is a narrow land mass about 1800 ft. across and 15 miles in length. The last 7 miles form the St Joe State Park. 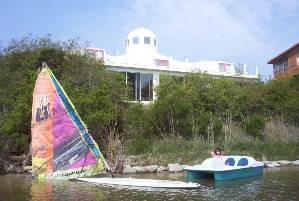 Our Monolithic Dome Home affectionately known as Bayrock rests on the bay side about a mile from the State Park. Across the street from our property is an access park with a boardwalk extending nearly to our property. It is handicap accessible, showers and restroom facilities are available, a playground for children, picnic tables and barbeques in a protected area with a second protected area that allows you to take in the views out of the sun. There is a planned bike trail to be built soon that will connect our property to the entrance of the St. Joseph Penninsula State Park. There are abundant rentals available on the beach but only one such as ours that offers access to both the beach and the Bay. 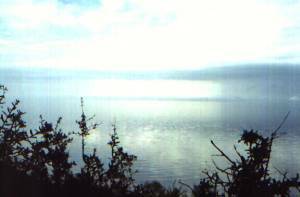 The bay is world famous for its' pristine clean waters. Swimming and snorkeling in the bay is much like swimming in an aquarium. We have enjoyed wind surfing on the Bay and sea kayaking. When kayaking we have viewed the endangered sea turtle and curious porpoises. There is a 500 ft dock and fishing peer available with boat lift. 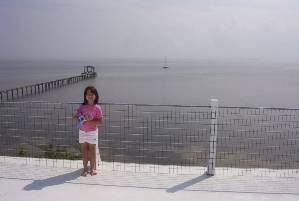 The bay also offers fishing, boating, scalloping, floundering, sailing, and shelling. Our seven year old spends hours along our private stretch of beach and shallows catching hermit crabs and chasing the fiddler crabs. The little fiddler crabs each have unique minature potraits painted on their backs making them little marvels to behold. Other wildlife we have seen from the porches include deer, racoons, armadillos, bald eagles, osprey, owls, numerous bird species and on rare occassions the local bobcat. Inside we have a surround sound DVD entertainment room upstairs with 31" TV, 2 person steam shower, and board games. 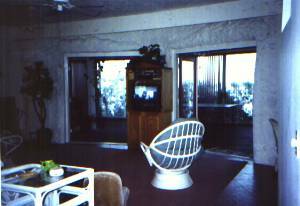 If you just need to relax, lay in bed, turn on the gas logs (in winter) and watch a favorite video on one of the 5 cable TV's then this is for you. 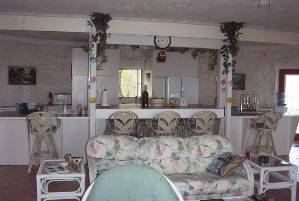 The kitchen is fully stocked with cooking accessories, a flat top cook stove, side by side refrigerator, coffee maker, microwave, toaster, and a gas grill just outside on the sceened in porch. The open living plan promotes relaxation and quality family time. We hope you enjoy our home. 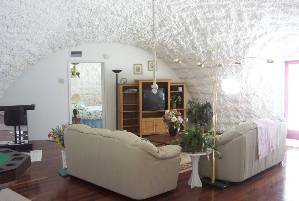 This home has 4 king size beds, 1 queen sleeper, 2 couches that will accomadate 2 youngsters. Each bedroom has a full bathroom and walk in closet. We don't mind if you bring your own air mattress etc., there is ample room. 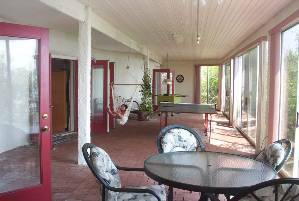 Above the glassed in porch is an expansive deck area with each upstairs bedroom opening out to. Linens and towels are not provided. On the Cape you will find boat and beach supplies available for rent, horseback riding. Scuba diving and parasailing are close by along with several spots to grab a meal or a snack. Early in the morning is when most people will go turtle watching as the sea turtles will come onto the beaches to lay eggs. They are endangered so be sure not to disturb them.